Are you all ready for the holiday?! This is the least ready I’ve ever been at this point and it’s slightly stressing me out, eeek! I’m really looking forward to some down time the next two weeks and being able to slow down and enjoy some lazy days. How will you be celebrating this year? We’re kicking things off today with our Christmas celebration with my dad’s family! Homemade Marshmallows – A batch of homemade marshmallows is perfect for hot chocolate, the best s’mores, or homemade treat bags for the holidays! 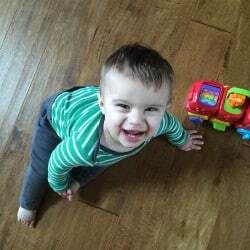 It’s Tuesday – New adorable (I’m biased) pictures of Joseph! 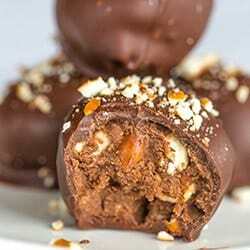 Nutella-Pretzel Truffles – Easy truffles made with Nutella and crushed pretzels, rolled into balls and dipped in chocolate. Italian Hot Chocolate (Cioccolata Calda) – Italian Hot Chocolate (Cioccolata Calda) is incredibly rich and thick – almost like drinking pudding. 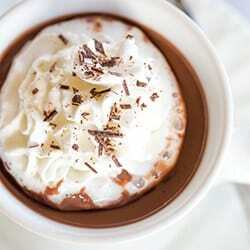 Such a decadent drink! I will take them all, please. These are the most adorable, festive cookies. Seriously gorgeous! I live for dips and pepper jellies, so this is a win-win! This recipe is pretty old, but I just came across it and can’t wait to roast a batch of mushrooms. Would you mind sharing your pork and gnocchi recipe? It sounds yummy! Hi Marla, Yes! I’ll be sharing it after the holidays, it was a big hit! Awesome! I am hoping to make it for my son while he is home from college. He loves gnocchi. Thanks for all of your hard work. Thanks so much for including my Christmas Tree Meringue Cookies! They are one of my most popular holiday desserts, so easy too! 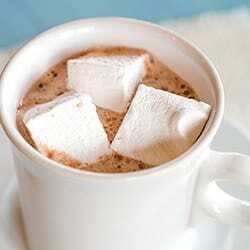 I really want to make homemade marshmallows this week. It will be a new test for me. Love the idea!